Few characters from the original Star Wars trilogy struck a chord with the fanbase in the manner of Jabba the Hutt. Despite his comically grotesque appearance, the slug-like alien was effectively the Don Corleone of a galaxy far, far away, overseeing a tight ring of criminals, bounty hunters and bodyguards from his dark and sleazy palace. 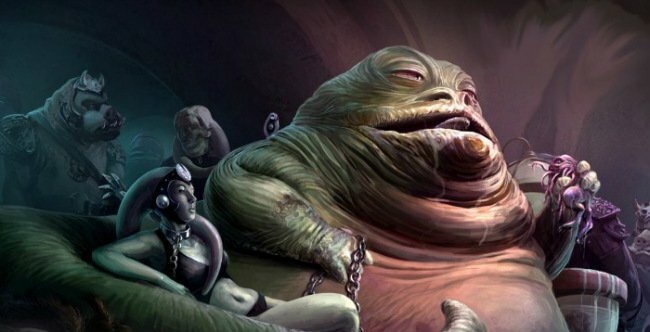 Despite a handful of appearances throughout the prequels, it was this deceitful legacy that ensured his lasting appeal, and it’s one that resonated with Pan’s Labyrinth and Crimson Peak helmer Guillermo del Toro, who recently revealed to Yahoo his own idea for a Jabba the Hutt prequel film. While it’s worth keeping in mind that this is still very much just a fleeting idea, it’s still a tantalizing prospect to entertain – even if it’s just wishful thinking. “I would do the sort of ‘Godfather’ saga the Jabba the Hutt had to go through to gain control. One, because it’s the character that looks the most like me, and I like him. I love the idea of a Hutt type of mafia, a very complex coup, you know? … I just love the character. Del Toro made the comments shortly after his Hall H presentation for his upcoming gothic horror, where actor Tom Hiddleston described the film as “an emotional roller coaster” that grips you with two hands and refuses to let go. As for that nascent Star Wars prequel idea, don’t hold your breath for Guillermo del Toro to race to the helm of one of Disney’s new chapters anytime soon, with the filmmaker noting that he is simply too busy to devote enough time to the company’s rebooted space opera.